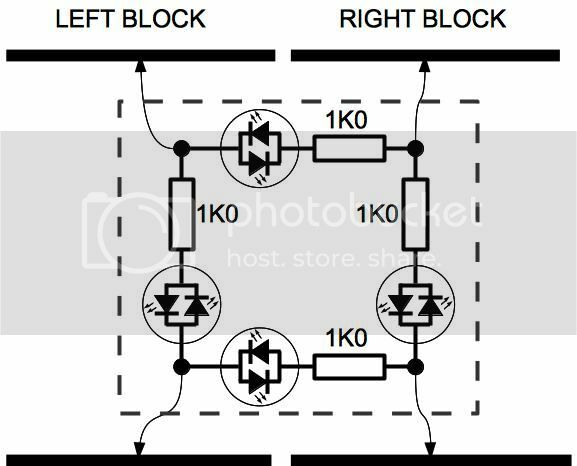 After problems with telling if our modular power blocks and module joins are the same polarity, not helped by those using flying leads, please use well marked sockets! I decided to make up a simple tester. Other means of testing have shown that a bad contact can give a good result when it is really wrong. The Tester is only 50mm x 35mm, has no batteries and just needs pressing down on the track across a board join. I used four bi-colour LEDs across the two track ends and between the modules. On the back are four brass contacts and a plastic guide to locate it between the rails. To get the best indication loco 0 is selected and set to full speed. Correct connection is shown when the left and right LEDs are on and the same colour (colour only works with loco 0) and the top and bottom LEDs are off. 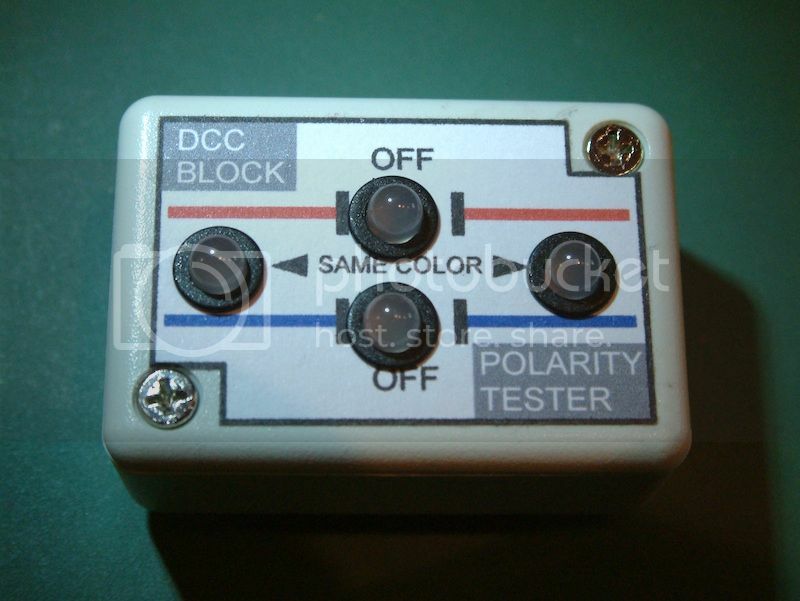 Reversed polarity is shown by all LEDs on and left and right colours different. Bad connection to the tracks is shown by either left or right LED off or all on and some dim. would you mind elaborating on this? As in write up a quick 'how to build' one, with a circuit diagram? This tool could come in handy for many other modular RR groups within the region (and beyond). Agreed Koos - that looks like a really useful thing to have in the toolbox for meets! Personally, I wouldn't use it because of the American spelling of the word "colour". That's the only bag I have with my recent MRH article, I persistently try to write everything in 'the Queen's English', as that was what I learned at school, but they have written back they were going to change all that into US english. oh well, nobody's perfect. It really is a simple circuit, I've drawn it up. All the bits were on hand. The bi-colour LEDs could be replaced with single ones wired back to back. I used brass contacts, but phosphor bronze would have been better. A larger box would make it easier, then the components could be mounted on a board. I just soldered them all together with some wires to the contacts on the back. When I get time I'll take some more photos.